I'm forever trying to find low-carb breakfasts that I actually look forward to eating. I don't care much for savory foods in the morning, so discovering that flaxseed makes a wonderful pancake was a major event for me. 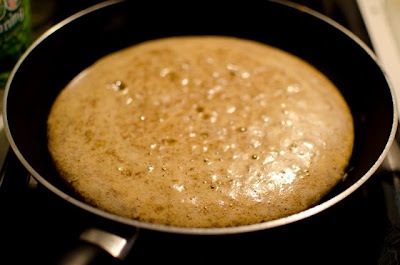 Mix everything (I use a measuring cup and a fork) and pour into a skillet or onto a griddle on medium heat. (I like to melt a little butter onto mine first.) Cook for a few minutes until the sides become firm and rounded and then flip over. I like to melt a tablespoon of butter onto mine and then sprinkle it with cinnamon and Splenda, but this would also work great as a savory wrap with eggs and sausage. Makes one huge pancake or several small ones. My pancake kind of fell apart this morning while I was trying to get it out of the skillet with a much-too-small spatula, but it was still delicious. 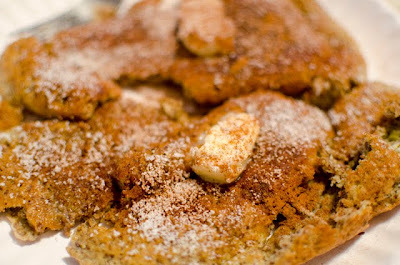 The texture is pillowy and bready, just like a carby pancake, but it has an earthier taste. It easily keeps me full from 7 a.m. until lunchtime. I can also see this being a really easy pizza crust without the vanilla, cinnamon, and Splenda and would love to know if someone uses it for that before I do! Love this recipe....so easy too! I made these for me and my daughter this morning and we loved them! I will definitely be making these again. Thank you so much! Great recipe. Made it this morning a sweet variation with syrup and cheese topping. My daughter made a savoury variation with savoury mince and cheese toppings. Both of these were delicious! I'm so glad I came across this recipe! I think my flax measurements were off since a tblsp of flax seeds does not equal a tblsp when ground. I totally wasn't thinking. It still turned out tasty enough. This is the best pancake recipe so far that's on my gluten/wheat free and low carb diet that I didn't have to use any other gluten free flours for either. It reminded me of pancakes I used to make with oat bran but I can't have oats now either. So, this recipe is a God-sent. Thank you! This has become my favorite recipe! I substitute the Splenda for stevie in the raw. Love it topped with peanut butter, sliced bananas and a little bit of raw honey! So easy and yummy :) love them! Do you have the nutritional stats on this??? A great option for fat and calcium, but if you're trying to stay under 20g carbs a day, that will bring you to over half. If you split the recipe in half, then this could be doable for breakfast! Thanks for sharing the recipe, I'm going to give it a try! Is there any way to make these eggless?